In 1940 and 1941 a group of ruthless gangsters from Brooklyn's Brownsville neighborhood became the focus of media frenzy when they-dubbed "Murder Inc.," by New York World-Telegram reporter Harry Feeney-were tried for murder. It is estimated that collectively they killed hundreds of people during a reign of terror that lasted from 1931 to 1940. As the trial played out to a packed courtroom, shocked spectators gasped at the outrageous revelations made by gang leader Abe "Kid Twist" Reles and his pack of criminal accomplices. News of the trial proliferated throughout the country; at times it received more newspaper coverage than the unabated war being waged overseas. The heinous crimes attributed to Murder, Inc., included not only murder and torture but also auto theft, burglary, assaults, robberies, fencing stolen goods, distribution of illegal drugs, and just about any "illegal activity from which a revenue could be derived." When the trial finally came to a stunning unresolved conclusion in November 1941, newspapers generated record headlines. Once the trial was over, tales of the Murder, Inc., gang became legendary, spawning countless books and memoirs and providing inspiration for the Hollywood gangster-movie genre. These men were fearsome brutes with an astonishing ability to wield power. People were fascinated by the "gangster" figure, which had become a symbol for moral evil and contempt and whose popularity showed no signs of abating. As both a study in criminal behavior and a cultural fascination that continues to permeate modern society, the reverberations of "Murder, Inc." are profound, including references in contemporary mass media. 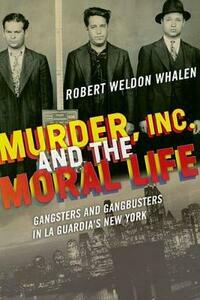 The Murder, Inc., story is as much a tale of morality as it is a gangster history, and Murder, Inc., and the Moral Life by Robert Whalen meshes both topics clearly and meticulously, relating the gangster phenomenon to modern moral theory. Each chapter covers an aspect of the Murder, Inc., case and reflects on its ethical elements and consequences. Whalen delves into the background of the criminals involved, their motives, and the violent death that surrounded them; New York City's immigrant gang culture and its role as "Gangster City"; fiery politicians Fiorello La Guardia and Thomas E. Dewey and the choices they made to clean up the city; and the role of the gangster in popular culture and how it relates to "real life." Whalen puts a fresh spin on the two topics, providing a vivid narrative with both historical and moral perspective.